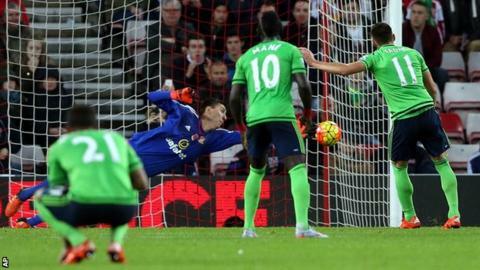 Southampton extended their unbeaten run in the Premier League to six games as Dusan Tadic's penalty left Sunderland in the relegation zone. Ronald Koeman's side bettered exchanges at the Stadium of Light and both Jose Fonte and Steven Davis saw efforts cleared off the line after half-time. The pressure told when Yann M'Vila fouled Ryan Bertrand and Tadic struck a fourth league goal of the season. Fabio Borini forced a save in response, but the away side easily held on. Victories for Leicester City and Manchester United mean the Saints were unable to reduce the gap to the Champions League qualification places, but back-to-back clean sheets for just the second time this season highlight the resilience of Koeman's side. Sunderland in contrast still have the worst defensive record in the top tier - conceding 26 goals this season - and while they looked more competitive than during last week's thrashing at Everton, the needless penalty conceded by M'Vila will deeply frustrate Sam Allardyce. How does Big Sam solve a worrying puzzle? Allardyce abandoned the back three he used in the 6-2 drubbing at Goodison Park in favour of a 4-4-2 system with a narrow midfield. The result was a fragmented game, but as time wore on, Southampton's extra quality became evident. Sebastian Coates denied Davis with a superb goal-line clearance and DeAndre Yedlin bravely stooped to clear Fonte's header off the line. Sunderland had one clear chance through Duncan Watmore on his full debut, but they only achieved a pass accuracy rate of 66% as attacks repeatedly broke down. So how does Allardyce - who admitted his side were "disappointing" - marry tightening Sunderland's system with offering some threat going forward? He needs a solution, his side have just one win in 15 league games. The Black Cats started the day with the lowest possession on average in the league (41.7%), and with just 35% against Southampton, they seem inept at building attacks to ease pressure on their back four. One-way traffic always looked like telling and when MVila - one of Sunderland's better players on the day - slid in as Bertrand posed little threat, Tadic whipped the winner left-footed into the corner, ensuring the Saints remain unbeaten on the road this season. Allardyce was frustrated his side were not given a penalty for a Maya Yoshida handball, but such an award would have been harsh on the defender and his team. Southampton were dominant - playing 555 passes to their hosts' 306 - and they could have been well ahead at the break as both Tadic and Sadio Mane saw efforts well saved by Costel Pantilimon. Having taken just two points from nine to start the season, the south coast club have now built momentum and by the time they face Stoke after the international break, will have gone more than two months without a defeat. Without European commitments Southampton perhaps have an advantage on those chasing a top four place around them and more somewhat ugly and efficient wins like this will certainly not harm their cause. Sunderland manager Sam Allardyce: "We are playing with fear and we need to get rid of that. In the end we have gifted it to Southampton. We need to pass the ball better. Our passing was poor and I think it's the fear of the position we are in. It could have been a point. We have to do better and cut out the silly mistakes. At the moment we are not good enough." Southampton will look to continue their fine form with a home game against Stoke when the international break is over while Sunderland must stew on defeat for more than two weeks before travelling to Crystal Palace for a Monday night fixture.